The Prof. Dr. W.J. Briels Karting Trophy was initiated on installation of Wim Briels as a professor in Computational Chemistry. The trophy is, of course, perpetual glory and fame; physically, it is shaped as a, once shiny, bowl - the winners being engraved to all eternity. Each team consists of at least three competitors. The fastest lap times of the three fastest competitors of each team are decisive for the final result. A team that has been challenged to defend the trophy should respond within 2 months. If not, the trophy will automatically go to the challenger. In situations not covered by the rules above, Prof. Briels will take a bonding decision. Our Karting Crew is not only succesful on their home track in Enschede, but have achieved astonishing lap times on other tracks as well! 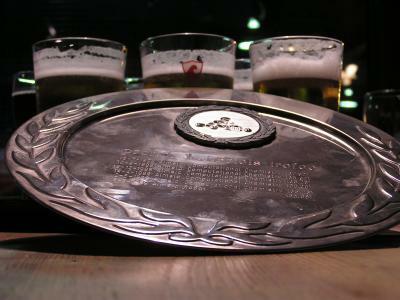 On June 22, 1999, we beated both the Fysko karting crew (Wageningen University and Research Centre) and the Van 't Hoff crew (University of Utrecht) in the Open Dutch Physical Chemistry Karting Competition and won the renowned Dhont Cup.